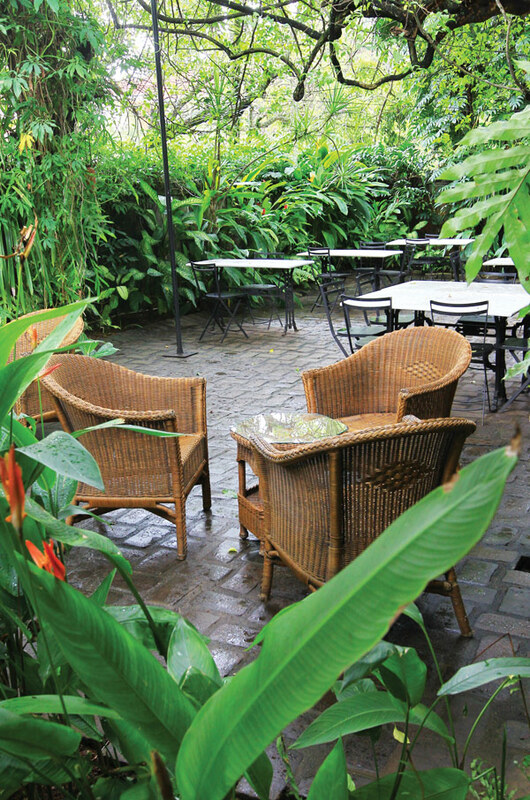 Seated in the sun-speckled, courtyard of this 80-year-old colonial bungalow surrounded by Frangipani, Bougainvillea and the soft strains of piano music, I truly was in an oasis in the heart of a bustling Colombo. Having been in operation for just over a decade, the Havelock Place Bungalow has catered to the whims and fancies of many a satisfied guest. In fact, a note in its guest book describes it as ‘a tranquil garden with features and flavours to refresh the senses.’ Its allure continues to charm first-time visitors even today. Composed of three suites and four standard rooms each with its own private courtyard or direct access to the Bungalow’s lush gardens, pool and jacuzzi, this boutique hotel invites guests to experience its old-world charm, colonial architecture and hand picked antique furniture while enjoying modern amenities such as 24-hour wireless internet access, cable TV and laundry facilities. Reserved exclusively for residents, the tastefully decorated living room is the perfect place to sip a glass of wine while enjoying a novel or magazine from the Bungalow’s carefully chosen collection. Open to both residents and others, the Bungalow’s restaurant is open from 7.30am till 10.00pm. Its menu is one of fusion cuisine. Breakfast dishes include Pancakes with Orange Butter Sauce, Waffles with Bee’s Honey and Roti with Chicken Curry and Seeni Sambol. A selection of homemade jams such as Carrot and Cardamom and Banana and Cinnamon are always available. Roast Pumpkin, Mushroom and Spinach Risotto, Sri Lankan Chili-Beef fry with Savoury Rice, Cadju Curry and Homemade Chutney and Maple-Roast Pork with Sweet Potato, Chilli Butter and Greens are included on the lunch and dinner menu. Desserts include Slow-Baked Lemon Tart with Vanilla-Bean Ice Cream and Chocolate Marquise with Vanilla Anglaise and Toasted Nuts.The Havelock Place Bungalow is most well known for its mouth-watering homemade ice creams and sorbets. Ranging from Cardamom and Honey to Passion fruit, and Coconut and Almond, these frozen treats are not to be missed. The regularly updated ‘Specials Board’ provides a wider choice while a range of snacks are available throughout the day. The option of indoor or outdoor dining provides guests with the opportu-nity to enjoy their meal under the stars or in the comfort of the inti-mate dining room. The Bungalow is also an ideal venue for private functions. With its eclectic combination of the old and the new, the Havelock Place Bungalow is the perfect choice for the business traveller, the tourist and the foodie alike.